When you invite me to your school, whether it’s for a full day, a half day, or an evening, my time is yours. For a full day, I can do up to four 45-60 minute presentations, and two presentations for a half day. With either, I like to do a separate shorter presentation (approximately 30 minutes) just for kindergarten. But you don’t have to limit yourself to assemblies! There are lots of other options, from working with one grade level for the day to doing small group mini-lessons on specific writing topics. Let’s talk about what would work best for your school! I Don’t Have a Clue What to Write About! Kids aren’t the only ones who get stuck when faced with a blank page. Writers of all ages sometimes struggle to find something to write about. We’ll investigate two ways to come up with ideas, do some brainstorming, and take the mystery out of turning an idea into a finished story. Along the way, we’ll compare students’ writing practices with those of published authors. Students love hearing that what they’re doing at school is what “real world” authors do! Especially good for reluctant writers. You may be surprised at how many places a book goes on its journey to publication – and how many people it “meets” along the way! We’ll look at just how far a story goes as it travels from being just an idea in a writer’s head to becoming a published book – and how long the trip takes. This presentation incorporates some basic geography and math elements, making for a well-rounded session. Great for reading nights, too! 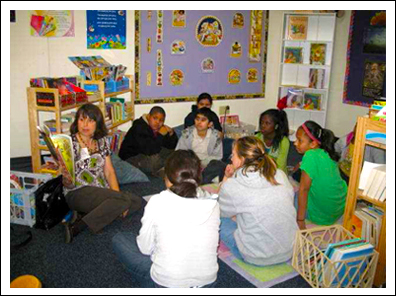 We’ve all heard that “it takes a village to raise a child.” Did you know that “raising” a book is a group effort, too? The idea for a book may come from the author, but it takes the time and talents of many people to turn an author’s work into a published book! We’ll take a look at the different jobs necessary to bring a book to life, as well as the different steps in the process. Learning that it takes more than a writer to publish a book can be eye-opening — and empowering. Great for literary night programs, too! The Three Little Pigs, Goldilocks and the Three Bears, the Three Billy Goats Gruff. The number three is an important element in children’s literature, as well as an important tool for writers. We’ll look at how the “magic of three” helps writers create conflict, maintain tension, and hold readers’ interest. Once you know how to use the “magic of three,” writing a good story is just about as easy as…well, one, two, three! Find out five ways to lure readers and keep them “on the line.” These strong starts work for fiction and creative non-fiction, and a reproducible for teachers will be provided. Students will get guided practice, then write and share examples. Most of my school presentations can be adapted for public library programs, or I can create a new program based on a specific theme. 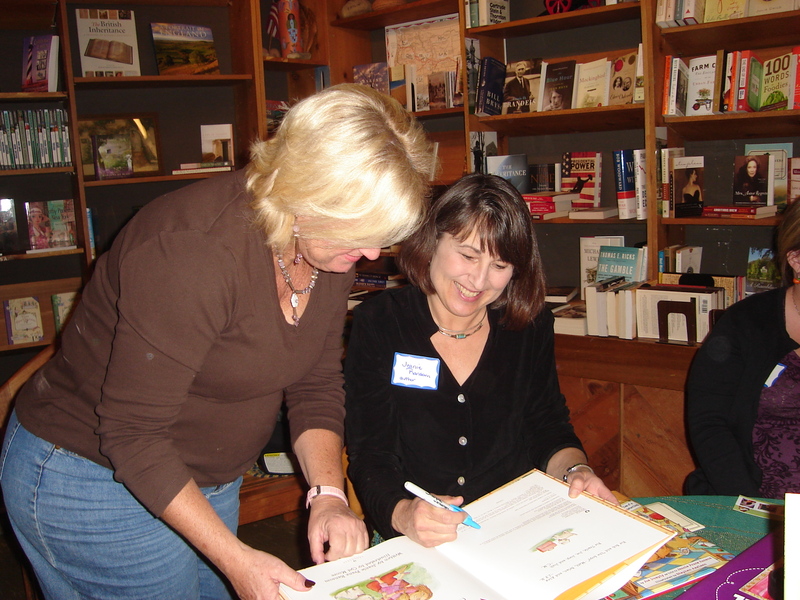 I’ve had experience working with readers, writers, and the just plain curious, from kids to adults, so if I can help you with an event at your library, just send me an email! It’s a challenge for anyone who works with kids to help guide and support them in today’s troubled times. Books are a non-threatening way to introduce tough — or tender — topics and open the lines of communication. The right book in the right hands at the right time can make the difference in the life of a child who may be feeling alone in his or her situation. This presentation will take a look at bibliotherapy, including the difference between niche books and trade market books, a look at resources for a wide range of topics, and real-life examples of how books can be used therapeutically. Handouts are included. So you’ve always wanted to write for children, but you’re not sure where to start? You’re not alone! You’ll hear about one author’s route to publication, then learn how to plan your own journey, including what you need to pack in your wwriter’s “suitcase.” Handouts are included. Free CCSS-Aligned guides are available for What Really Happened to Humpty? and The Crown Affair. To download the guide for What Really Happened to Humpty?, click here. For The Crown Affair guide, click here.